Last wednesday we left for an amazing 4 day road trip, meandering up the coast to Monterey, California, a land beautiful beyond words. Jump cut to Monday: 700 photos sitting waiting to be processed, payroll to be sorted out, three story deadlines to meet, 2 new wedding client contracts to be drafted and a three year old to nurture and entertain. 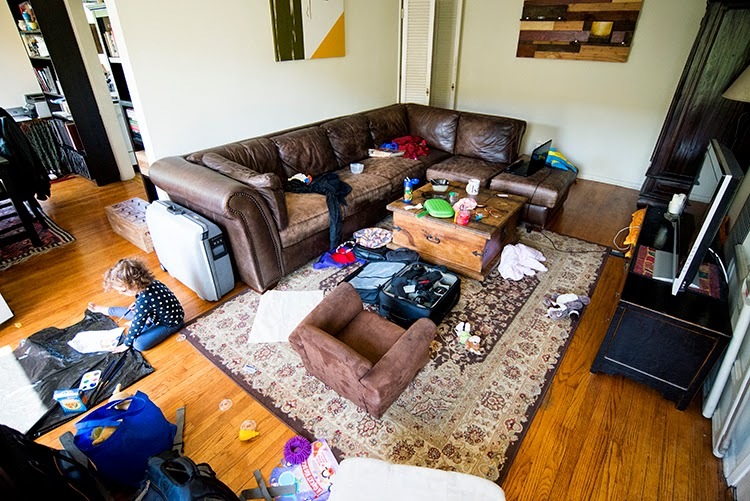 Sometimes, full disclosure of the reality of a work-at-home-mom is the only appropriate discourse, and so as I run to kitchen to try and scrounge up something that looks like dinner, I have chosen to simply leave you with this; a picture of our living room, that I am lovingly referring to right now as a tornado. It’s not too pretty. Our suitcases still haven’t been unpacked! (haha) Our cameras are waiting patently to be cleaned for the next job, my laptop sits bursting with photo processing and social media managing, dirty lunch plates screaming at me, toys strewn about and our toddler pleasantly painting a masterpiece. In the brief moments when I think, about the ‘greener grass’ peering at me from a windowed office, I remember just how incredibly lucky we are as a family to have the experiences we choose, feel the love we feel and continually build upon the life we aspired to in the wildest dreams of our youth. They are coming true in every direction we look and I stand here in the middle of this mess feeling nothing but gratitude. ← [Wandering Wisdom Wednesday] Every moment of light and dark is a miracle. Your tornado was milder than mine. 😉 Cleaning and taking care of dinner as a WAHM is more difficult than I ever imagined it would be. I think I had more time when I worked outside the home. This is pretty much my life on a regular basis. I work from home, and so does my husband, from an approximately 1,000 square foot house with a toddler. Something's gotta give, and it's gotta be housework. I have a cleaner come every three weeks to make sure we're not housing dust balls the size of my child under our beds.